Astrophysicists at the University of Bern have modelled the evolution of the putative planet in the outer solar system. They estimate that the object has a present-day radius equal to 3.7 Earth radii and a temperature of minus 226 degrees Celsius. In the far infrared the planet is much brighter than in the visual. The Swiss scientists are experts in modelling the evolution of planets. They usually study the formation of young exoplanets in disks around other stars light years away and the possible direct imaging of these objects with future instruments such as the James Webb Space Telescope. Therefore, Esther Linder says: “For me candidate Planet 9 is a close object, although it is about 700 times further away as the distance between the Earth and the Sun.” The astrophysicists assume that Planet 9 is a smaller version of Uranus and Neptune – a small ice giant with an envelope of hydrogen and helium. With their planet evolution model they calculated how parameters like the planetary radius or the brightness evolved over time since the solar system has formed 4,6 billion of years ago. The study was financed by the research project of the Swiss National Science Foundation PlanetsInTime and the National Center for Competence in Research (NCCR) PlanetS. In their paper accepted by the journal “Astronomy & Astrophysics” the scientists conclude that a planet with the projected mass equal to 10 Earth masses has a present-day radius of 3.7 Earth radii. Its temperature is minus 226 degrees Celsius or 47 Kelvin. “This means that the planet’s emission is dominated by the cooling of its core, otherwise the temperature would only be 10 Kelvin,” explains Esther Linder: “Its intrinsic power is about 1000 times bigger than its absorbed power.” Therefore, the reflected sunlight contributes only a minor part to the total radiation that could be detected. This also means that the planet is much brighter in the mid and far infrared than in the visual and near infrared. Overall, the scientists calculated magnitudes between 20 and 22 in the visual, but of 11 in the far infrared. “With our study candidate Planet 9 is now more than a simple point mass, it takes shape having physical properties,” says Christoph Mordasini. The researchers also checked if their results explain why planet 9 hasn’t been detected by telescopes so far. They calculated the brightness of smaller and bigger planets on various orbits. They conclude that the sky surveys performed in the past had only a small chance to detect an object with a mass of 20 Earth masses or less, especially if it is near the farthest point of its orbit around the Sun. But NASA’s Wide-field Infrared Survey Explorer may have spotted a planet with a mass equal to 50 Earth masses or more. “This puts an interesting upper mass limit for the planet,” Esther Linder explains. 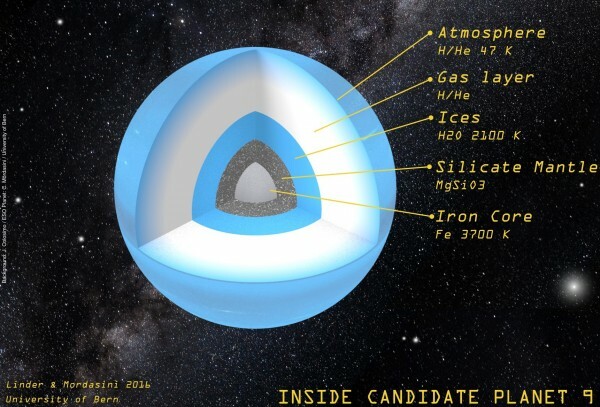 According to the scientists, future telescopes like the Large Synoptic Survey Telescope under construction near Cerro Tololo in Chile or dedicated surveys should be able to find or rule out candidate Planet 9. “That is an exciting perspective,” says Christoph Mordasini.